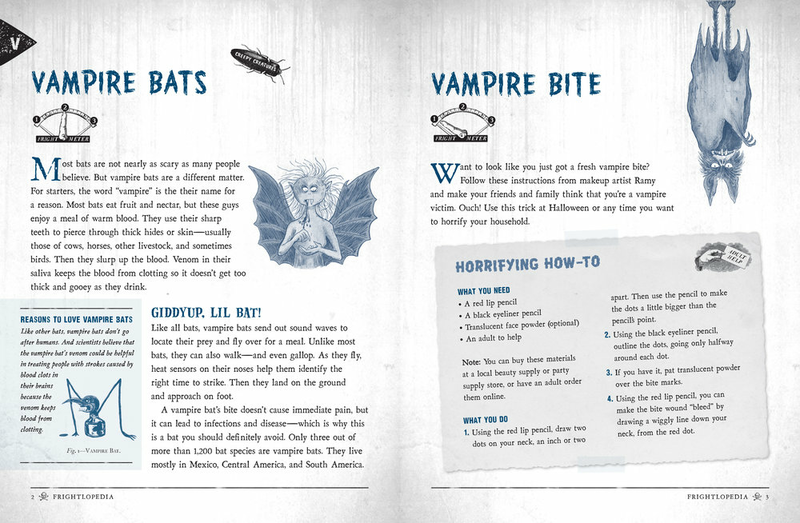 Frightlopedia is the kids’ guide to everything scary, from Arachnids to Zombies. It brings fresh perspective—and sometimes fresh blood—to classic topics like ghosts, witches, and zombies, while introducing readers to petrifying places and creepy creatures they never heard of before (a tarantula the size of a dinner plate anyone?). Each entry has a Fright Meter that lets readers choose if they want just a few goosebumps or a major shriek fest. Horrifying How-To entries show kids how to haunt their own house, apply perfect zombie makeup, and create an Evil Scientist lab. An extra bonus: wonderfully macabre illustrations by Stefano Tambellini. Buy at IndieBound. Buy at Barnes & Noble. Get a free taste of Frightlopedia below. Read the Frightlopedia interview with the Goosebumps creator R.L. Stine. To arrange a Frightlopedia author visit to your school, library, or bookstore, click here. Photos: International Game Fish Association (vampire fish); Axel Fassio/Photographer’s Choice, RF (vampire finch); DEA/ARCHIVIO B (vampire moth).